Sun Setting on the Ocean, oil on canvas, 30"x24"
James Hamilton was born near Belfast, Ireland in 1819 and moved to Philadelphia with his family when he was fifteen. Though enrolled for a time at the Pennsylvania Academy, Hamilton was largely self-taught, finding inspiration in popular engravings of the time. 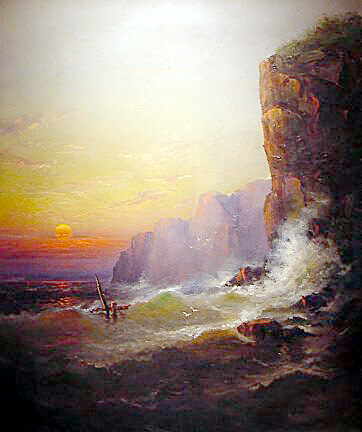 He eventually established himself as a marine painter in Philadelphia, worked as an illustrator, and took students, the two most famous of which were the brothers Thomas and Edward Moran. 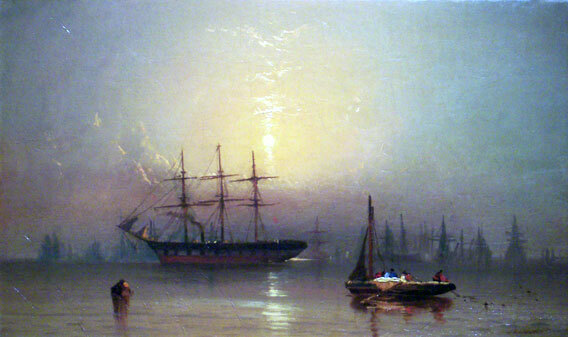 Hamilton was undoubtedly influenced by Philadelphia marine painter Thomas Birch, and he shared the mid-nineteenth-century American fascination with J.M.W.Turner. In 1854, Hamilton journeyed to England, where he could view Turner’s work first-hand, and his Turneresque treatment of light gradually won him the sobriquet “the American Turner.” Hamilton became deservedly well known in his lifetime. A Hamilton painting based upon a scene from Dombey and Son was presented to Charles Dickens during Dickens’ tour of America in 1867. The artist moved to San Francisco in 1876 at the height of his success and died there in 1878. Hamilton’s work can be seen today in the permanent collections of many museums throughout the United States, including the Butler Institute, the Chrysler Museum, the Museum of Fine Arts, Boston, the Metropolitan Museum of Art, the Smithsonian American Art Museum, the Pennsylvania Academy of Fine Arts, the Brooklyn Museum, the Wadsworth Atheneum (Hartford), and the Yale University Art Gallery.